With the litany of equipment, gear, and accessories produced by camera companies around the world, it can be a trying task to determine what best suits your needs. Since its inception, Canon has proven to be a leading manufacturer within the imaging industry. Today, we’re taking a look at Canon’s best zoom lenses in hopes of finding which model offers the best bang for your buck. Divided by focal range, we’ve taken into consideration the price, image quality, and design behind each one of these pieces. Does the lens on your wish list make the cut? Keep reading to find out what we believe are the best options out there today! The widest available lens in Canon’s L-series, the EF 11-24mm lens is a natural choice for many working photographers. A durable lens, it’s tough enough to go through the trials of everyday life and continuously create fantastic images. Designed to protect the inner elements from harmful dust and water, it’s also resistant to smearing and fingerprints. Thanks to four aspheric elements within the lens itself, it experiences minimal distortion despite offering an ultra wide view. With a focusing distance of just 11 inches, this fantastic piece of glass is even usable in tight spots, making it great for interior shots as well as landscapes. The major aspect holding most buyers back from purchasing this lens is its hefty price tag. At over $2.5K, it’s enough to make most photographers second guess their decision or experience some degree of buyer’s remorse. That being said, if you’re willing to invest, you’ll likely be pleased with the consistently high-quality output this equipment provides. Related Post: 50mm vs. 35mm – Which DSLR Prime Lens should I buy? The EF 17-40mm provides all of the perks of Canon’s acclaimed L-Series at an affordable price. Like the 11-24mm, it has a focusing distance of just 11 in, making it a useful tool for those finding themselves in tight situations. As one could expect from an L-series lens, it’s got a solid build and is anything but fragile. It provides ultra sharp shots, with a contrast and color quality that’s sure to stun viewers. All in all, it fulfills almost everything a person could want from a wide angle lens. Therein lies this camera’s downfall. It does receive occasional complaints on relatively benign issues such as chromatic aberration. However, a large percentage of viewers report that their main complaint is that this lens is average. It doesn’t offer some of the bells and whistles seen on fellow L-series lenses and does very little to go above and beyond the competition. On our list of ultra wide angle lenses, the Canon EF-S 10-22mm offers the widest field of view of the bunch and represents one of the best-cropped sensor options available on the market. Like any lens, it has a few down sides. Users will experience a certain degree of distortion at the shortest focal lengths. The fact that it is designed for cropped sensor cameras means that it’s less compatible with many of the popular full-frame DSLR bodies professionals opt for, such as the 5D Mark IV or the EOS 6D. Despite these setbacks, this is a lens that rarely disappoints users that go into the purchase with realistic expectations. In particular, it’s said to be an excellent choice for architectural photography. The imperfections in the optics of the 10-22mm reflect less on the quality of the glass and more so on our own technical limitations. With a maximum aperture of f/2,8, the Canon EF 16-35 zoom lens provides the rare combination of wide f-stop capabilities with a variable focal length. A fast, quiet option, it’s auto-focus makes it easy to get a sharp image almost instantly. Furthermore, its low aperture makes it easy to get great results in low-light situations, making it an excellent choice for photographers out after dark. Unfortunately, this lens is a bit bulky in comparison to other similar models (though it’s not so unruly that travelers and event photographers can’t make use of it). In addition, some people are turned off by the lenses tendency to vignette and soften image edges. The fact of the matter is that a few sacrifices to overall image quality had to be made in order to keep costs down, much to the dismay of a handful of potential buyers. 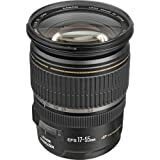 OUR PICK (BEST CANON WIDE ANGLE ZOOM LENS): The EF 11-24mm F/4-L – If you’re able to get past the price, it’s easy to fall for this lens. It works in close quarters, its images are undeniably gorgeous, and it can hold its own against the elements. What’s not to love? 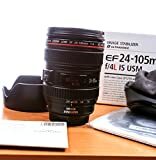 In line with other L-series lenses, the Canon EF 24-105mm is a solid, multi-purpose lens intended to fulfill the needs of professional photographers. The feel of the lens immediately points to the craftsmanship of the product. Although it’s a bit weighty, it offers smooth controls that allow users to seamlessly shift between settings. Equipped with an effective image stabilizer, it does an excellent job at “saving” images from blurring. For photographers utilizing low ISOs and long shutter speeds, the inclusion of the stabilizer is crucial. Users should be aware that this lens doesn’t always produce the greatest image quality. At times, photographs can take on a “soft” look. In addition, it’s common to experience distortion at either focal length extreme. Nevertheless, the versatility paired with an affordable price makes it easy to overlook any potential flaws that this glass may have to offer. If you’re using a cropped sensor camera, the Canon EF-S 17-55mm is certainly worth taking into consideration. The number one thing that this model has to offer is impeccable image quality. Its results are tack sharp, almost comparable with some of its prime counterparts. When utilizing wide apertures, it produces smooth bokeh that beautifully melds together distracting background elements. It also allows for mechanical focusing under any circumstance. This means that it’s possible to make minor adjustments even when AF mode to ensure that your focus is spot on. As far as build goes, owners need to be cautious about keeping the lens clean. It has a tendency of collecting dust buildup within the interior, so long term use of this lens means diligent upkeep and care. Otherwise, the biggest criticism this model receives is its cost. Though it is a fine lens, it’s important to take into consideration that it sports an L-series price without all of the L-series accessories. Compact and lightweight, this lens is an excellent all purpose choice for the photographer on the go. Like the EF 24-105mm, it’s equipped with Image Stabilizers that are beneficial in the steadying photographs. It’s got a very large focal range and magnification capacity, making it possible to capture subjects far off in the distance. As another cropped sensor specific lens, it doesn’t work with every DSLR body out there. Aside from that, there are a few flaws to take into consideration before purchasing this glass. Although it produces sharp images, it can experience some severe vignetting. The longer the focal length, the more pronounced this issue can become. It’s focusing is fast and quiet, and can even perform in low-light situations. However, the longer the focal length in use, the slower the lenses focus time takes. By far the priciest mid-range zoom on our list, the Canon EF 24-70mm lens proves to be worth every penny. With this glass mounted in place, it’s easy to walk into virtually any situation feeling confident and competent. Providing superior sharpness, color, and contract, the overall image quality is easily on par with any prime. Considering the results it guarantees, it’s easy to justify the cost of this impressive piece of glass. It does work a bit slowly, and it is a bit heavy for everyday use. It also lacks image stabilization capabilities, which makes it difficult to use for spontaneous shooting or to capture moving subjects. Though it’s an excellent choice for still studio artists, photojournalists and event photographers may struggle using the EF 24-70mm. You should invest in this equipment; you won’t be disappointed in the pictures you get – so long as you keep in mind the lenses limitations. OUR PICK (BEST CANON MID RANGE ZOOM LENS): The EF 24-105mm f/4-L – Canon’s L-series continues to live up to industry standards, and the EF 24-105mm is no exception. Affordable when compared face to face with other lenses of its stature, it’s a financial choice that doesn’t leave you tossing and turning for days afterward. It’s IS technology gives it an element of versatility beyond its variable focal length. Canon’s first iteration of the 70-200mm was certainly nothing to sneeze at. 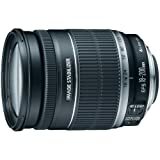 However, this re-release if the Canon 70-200mm features improvements in speed, image quality, and overall performance that solidifies this as one of the best telephoto zooms Canon has to offer. Its top of the line design is suited to perform in many challenging situations. With a wide aperture rare to find on a telephoto lens, it’s indispensable in low-light situations. It’s equipped safeguards to keep out any potentially harmful dust and moisture. As one of the least expensive professional-grade telephoto lenses available, its price tag falling below $2k makes it a tempting choice. The main complaint most owners report is the overall weight of the equipment. But to a certain extent, heaviness is an inevitability for working in the field with a large telephoto lens. No matter how you slice it, the Canon EF 28-300mm telephoto zoom lens is a great catch all lens. As a part of Canon’s L-series, it sports high-quality glass and a precise build. Capable of capturing impeccable imagery, it’s suitable for tack sharp still photography and videography alike. Unlike most telephoto lenses, it’s incredibly compact – enough so that one user claimed that it was small enough to fit inside of a purse. For this reason, it’s an excellent choice for the traveling photographer looking to downsize on gear. However, the materials used do come at a price to the lenses overall usability. All of the glass and gears used to make this precision lens results in it being very heavy. For many photographers, it proves to be a little too much to regularly bring out in the field. Without a monopod or tripod at hand, it can be difficult to get the clear, crisp photos that this lens is capable of producing. Offering the furthest reach of any of the lenses included on our list, the EF 100-400mm is one of the best options out there for wildlife and sports photographer. If, for whatever reason, you can’t up close and personal with your subject, look no further. It’s hard to find much to complain about concerning this lens. With fantastic autofocusing, it’s able to pinpoint areas of interest without much fuss (even when faced with complex situations). In particular, users have noted that this iteration has provided significant improvements to the color and contrast seen in images. Unfortunately, like most telephoto models, it is a bit pricey and may be out of many buyer’s budgets. But with an unbeatable range that can capture subjects yards in the distance, it may very well be worth your while to break your bank for this lens. No, that price isn’t a typo – this telephoto lens sells for well under $500. Although its cropped sensor design does limit its capability a bit, there’s no beating the Canon EF-S 55-250mm Lens regarding affordability. Overall, it’s quite versatile and can capture a relatively sharp shot with ease. It’s quiet and discreet, making it a great fit for image makers looking to get around without a giant piece of equipment hanging around their neck. Buyer beware – seasoned professionals may be underwhelmed with what this lens brings to the table. It’s not equipped with the technology or top of the line glass standard in the L-series, and its performance isn’t going to be on par with the most expensive models. But for amateurs looking to upgrade their kit lens and get a further reach, this will do the trick without doing a number on your wallet. Closest focusing distance: 0.85m/2.8 ft.
Diagonal angle of view: 27 Degree 50 ft. - 6 Degree 15 ft.
OUR PICK (BEST CANON TELEPHOTO ZOOM LENS): The EF 100-400mm F/4.5-5.6-L II – In this case, the sequel has surpassed the original. 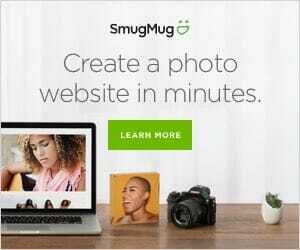 With improved image quality and an easy user experience, its tweaked any of the minor flaws it may have had in the past. 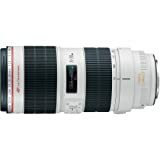 Paired with its unparalleled focal range, this telephoto is representative of the best Canon has to offer.